Dental checkups are an essential part of any preventive dentistry treatment plan at Pleasant Grove Family Dentistry. Dr. Torrin Marracino and his team recommend patients attend preventive dental checkups at least two times each year. This gives us the opportunity to get to know patients and their oral health care goals. It also allows us to work with patients to prevent many common oral health issues like tooth decay and gum disease. Finally, these regular visits make it possible for us to diagnose and treat those dental health issues that cannot be prevented in their earliest stages, so patients avoid more time consuming and costly dental treatments down the line. If you’re new to Texarkana, Fouke, or other surrounding communities, we invite you to contact our team to schedule a checkup today. At our office, we take the time to offer thorough examination and cleaning during every six month dental checkup. We start by capturing diagnostic x-rays that are used to give us a complete understanding of the underlying, supportive oral structures. Then, we visually examine teeth and gums, screening for warning signs of common oral health issues including tooth decay, gum disease, bruxism (teeth grinding and clenching), temporomandibular joint (TMJ) dysfunction, and oral cancer. 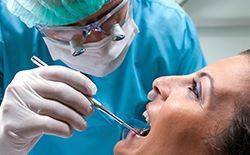 Next, one of our skilled dental hygienists carefully cleans even the hardest to access areas of patients’ smiles systematically removing plaque and tartar buildup. Finally, patients site down with Dr. Marracino for a one on one consultation. During the consultation, the patient partners with the dentist to develop a personalized treatment plan for maintaining their healthiest smiles.